MHX & Powered Up are well worth picking up if you have a Vita TV with a JP account, Also the PSP version of Legends/Dash 2 comes with the "Episode 1" content that was removed from the Western version, it's obviously in Japanese but some of the scenes are still funny like Tron's daydream of her & Volnutt teaming up together. did they find a way too emulate megaman powered up!?!? Japan only. The issue has been with US and UK versions. If you wanna play MMPU on a TV you have at least two options: Get a PSP 3000 and use the av cable to display on a TV, which will look awful. Or play it on your PC via other means, which actually looks really nice. Which there isn't an issue,as I have proven before Protodude; and they refuse to have the game retested. 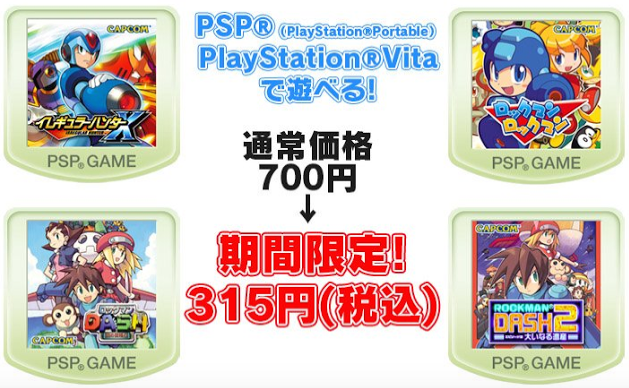 At this point though, they have missed there window for any extra sales, as the pSP and vita are dead now. I prefer a physical copy instead of digital copy, thank you but no thanks. Agreed infinity times over and over! Hey, one day there will be an emulator to play PSP games on Vita. That's why I am waiting patiently or playing them on MAC/Windows called PPSSPP emulator. Why buy it if they aren't getting more sequels for it ? Be wise! Perhaps because the singular work itself, independent of the possibility of future installments, is worth the price and more. The worth of a product should not be measured by 'will it have a sequel?' It should be measured by how it stands itself. I'd say the games in question still stand tall and are worth the money. ...My ideal circumstance is that they port them to PC one day.